In this installation of the Top Audience Response Keypad Manufacturers series, we review the capabilities of the Meridia Interactive Solutions line of audience response keypads. Meridia Interactive Solutions (Meridia) is one of the longest standing suppliers of audience response systems in the industry. Their audience response platform consists of four keypad clickers manufactured with the help of a Chinese OEM. 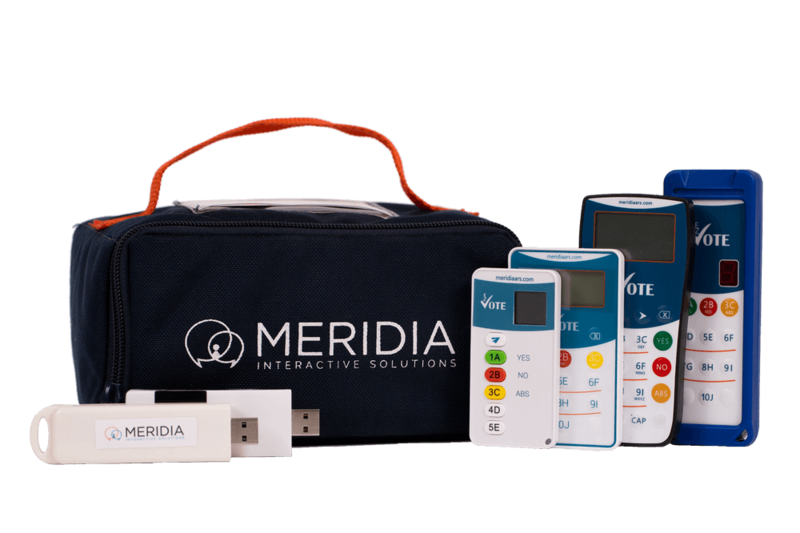 With an impressive line of hardware, Meridia is often used at association meetings, continued medical education programs and trade shows. A large proportion of Meridia’s customers make long term investments in audience response, going the purchase route instead of using them for ARS keypad rental. Meridia’s audience response keypads come with a minimum 3-year warranty, zero hidden annual fees and lifetime access to training and support. Meridia’s EZ-Vote audience response keypads come with already-installed live polling apps and software for interactive presentations, e-voting, and gamification. Their keypad devices, like the majority on the market, use radio frequency to secure network connectivity instead of relying on the Internet. Meridia’s EZ VOTE keypad range is diverse enough to accommodate a wide range of needs. The EZ-Vote 5 is the most portable and budget friendly ARS keypad device on offer. Meridia’s biggest handheld device on offer, the EZ-Vote HD is its most heavy-duty keypad. With a four-year battery life and adult scale ergonomics, it’s a preferred choice for government and military professionals including police and fire teams. EZ-VOTE 10 is Meridia’s most popularly used audience response keypad, featuring a large LCD display and multi-digit voting functionality. 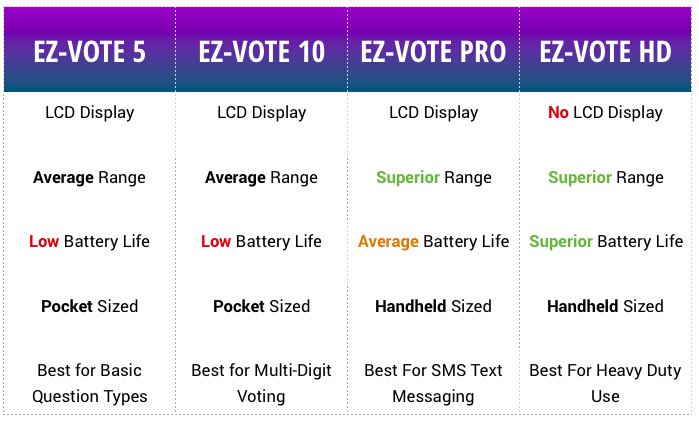 The last of its range, the EZ-VOTE PRO has the largest display and most robust features on offer. This keypad line has dedicated buttons for ‘Yes, No and Abstain’ responses, and supports SMS text messaging.